Pretty little surprises greeted me in my mailbox today. I’m talking physical mailboxes okay, not the email-boxes… Miray, our sponsored child, sent us a short note that doubled up as a Christmas greeting card and a 2008 calendar all in one. And then there was also a cute red Christmas card (what a coincidence eh? *wink*) that goes oh-so-well with my blog, sent all the way from Australia by May! Thank you for being so thoughtful! I have to admit, this year I began sending Christmas cards again. After so many years of e-cards, I have always felt snail mail cards are just so much more personal. But that’s just me! 🙂 The two cards I received today will add to my Christmas card collection this year, the first one being the one I received from Mom and Dad last week, all the way from Ipoh. wow..that is quite a lot of gift. i’ll be seeing or getting mine only on the 24th..hmm.. The Giddy Tigress says: I’m sure it will be worth the wait..
lovely cards and lotsa gifts! There are no pressies under the tree for me? Hehehe. J/k. I’m collecting my X’mas cards too! The Giddy Tigress says: Thanks! 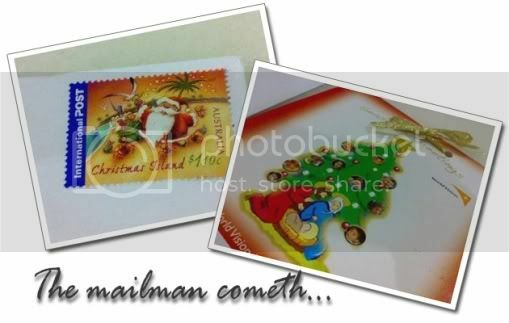 The Santa stamp wasn’t even stamped! Our Xmas tree is still without any pressies under it. 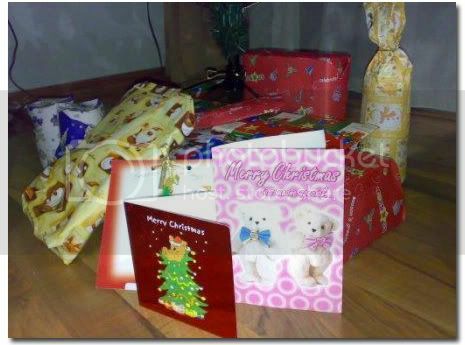 The pressies will only be put there on X’mas eve, else my kids will rip those gifts apart. You are from Ipoh too? Main Convent I guess? The Giddy Tigress says: Yeah I am from Ipoh, and yes from Main Convent… how did you guess? Were you from Convent as well? The Giddy Tigress says: Yep, counting the seconds too… merry Christmas to you Pink Cotton! The Giddy Tigress says: And same to you too! Snail mail is indeed more personal ;). Merry, merry Christmas to you and your family! Happy holidays!! The Giddy Tigress says: Yes, I love the card! Thanks! Woohoo! Gifts under the tree! 😀 Merry Christmas! hi there. was bloghopping. Just love all those chrismassy posts going around this time of the year. The Giddy Tigress says: Merry Christmas and thanks for dropping by!